How about close combat drones with sprayers that emit clouds of nanotech robots that do nothing but rupture cell membranes, reducing all biological foes to steaming puddles of pink goo, hair, nails, and bones? I'm thinking of introducing a human faction that has starships and to get around AG restrictions use humans instead and go with direct neuro links. I thought it would be interesting to come up with a way to speed up the drop pods instead of slowing them down. It seems whenever someone tries to justify something like a drop pod in sci-fi they get slower and slower the more detail that is added, the more real science plays a part the slower they get. This basically rips up the physics rule book and allows drop pods to impact like meteors and everyone steps out in good shape. The only limit is the energy to the various fields that denotes the impact speed. I though it would be interesting to not only use the drop pod offensively like an artillery barrage, but they could even penetrate some subterranean Ecoroim bunkers. A massive impact clears the ground of everything via as massive impact crater, so even mines and anti-personnel drones cleared fro the assault team to set up a strong point with clear fields of fire. The assault team can move out from this fire-base anchor point. I know I've mentioned this before but what about neutron grenades? This sounds similar to the AG swarm only smaller. I image these nanotech bots could be used as an 'auto-win' verses certain targets (unarmoured?). Perhaps vulnerable to EMP? We have mentioned the foamer, what about some form of spray plastic for robots or killing, destroying AI? There have been numerous forms to destroy life but there will be mechanical things. This plastic could be thin or even thick but when sprayed gets into circutry and effectively shuts down circuts or shorts out ellectic pulses. It does no major damage to the machinery and can even be melted out but effectively nullifies the threat. On humans or other lifeforms it would clog pours and sufficate them. Armored troops nothing unless clogging air respiration. It an idea for specific types of AI and machines, these being electrical in nature. It would be a good weapon perhaps for a world like ours? For full AI in the AG sense, these use 'bionite wrapper' to construct and maintain the 'bio-photonic' networks and 'refraction gate chips'. It's like having fibre optics surrounded by a swarm of artificial bacteria which acts like a slim mould. This is usually wrapped up and sealed in robust containers. These are tough and self repairing systems, and not susceptible to shock, EMP or pretty much anything and will regrow even if damaged and will even attempt to repair the casing! As for hitting them, they are like those indestructible plugs - bouncy and hell: you could belt 'em with a sledge and they still work. The case is a protein polymer (similar to spider web) and is stronger than Aramid fibres (Kevlar etc.) and can resist bullets in excess of .50 calibre. This is why there agents, the Artiloids, are so tough. You can kick them out of a plane while high in the sky and they will bounce when the hit the dirt at terminal velocity, you can shoot them with a .50 sniper rifle and the will spin and come back on target ready to engage, the technology is robust and these are the 'ambassadors' the friendly PR face of the AG on human worlds. The 'swarm' is a whole new story. Mine Layers: Particularly if it lays walking Spider Mines! Grape Gun: essentially fires a package of grapeshot. From firing nuts and bolts to explosive nano bots or a horde of heat seeking biological acid beasts. Tag Gun: more of a mod than anything else. The smart AI Tag round will project a signal once it hits its target that will guide all the following bullets to its location, even if not even in sight of the shooter. Mole Gun: essentially a sticky round that hits, sticks and then drills through armour and clothes until it reaches flesh, the natural electrical field of a human being causing the round to detonate its explosive core. Smart Gun: a straight rip off of Jon Courtenay Grimwood's idea of a gun with an AI built in that can do anything from mentor its holder, selecting ammunition type or physically adjusting how it is being held in order for a more accurate shot. Imagine a world where rather than sending military training teams to the developing world instead job lots of 'dumb' AI guns are handed out which provide mentoring themselves! Spike Gun: fires solid ceramic spikes filled with, well whatever you want, from neurotoxins to hormone bombs. Tri Gun: fires thousands of tiny triangles that upon contact with the ground sprout four monofilament spikes making them into very small, deadly caltrops. The inside of the triangle holds a tiny buzz battery so that when someone steps on one of the caltrop spikes a taser like burst electrocutes them. Very useful for blocking off areas against lightly armoured enemies. Postscript: do you guys read Danger Room? It features a lot of weapons the US is trying top build which sound very science fictional, from pain rays to gay bombs. Silly or not, they sound like a lot of fun! I like the tag gun, and perhaps a little wasp-bot could be used that stings a target and brings the rain! The smart gun is always good, I had some ideas on this for Bolters in 40K, over here. Danger Room? I'll check it out, I like to read about all the new stuff they are coming up with. Reality is a great source of inspiration, thought sometimes fact is stranger than fiction! PS: Yep, I recognise Wired, I as reading about the Temple of Science the other day. As a more realistic autogun concept intended for slightly more serious tone. This is based on the H&K G11. It is a caseless ammo design (like the G11) the ammo is houses in the dark plastic strip magazine running along the top of the barrel. The Autogun is very cool though for practical and aesthetic reasons it might be cool to give it a grip handle like the ones the UK and US are adding to everything. Other than that I think it has just the right amount of SF mixed with practicality. Those things probably jam up as soon as the place is too moist, or too dry, or some sand comes near it, or mud, or plants, or if there is too much wind. Hmm, seeing as their is a bit of space under the barrel perhaps a flip down handle? Yeah, some of the M-16 seem to have a bad rep. 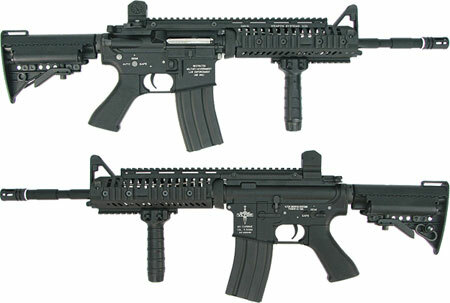 There is the like the Heckler & Koch's HK416 Assault Rifle which look similar (based on the M4). The did it in 'nam and they are still doing it. I saw a news report with US troops using AKs. Pointless factoid of the day, WW2 is the only conflict the US has entered where they had the most advanced infantry rifle in the world (the Garand). Opinion on the M16/M4 seems divided. Some maintain its fine with cleaning, others reckon they're junk. Regardless there are better rifles on the market and its amazing the US hasn't bought any. Then again I've seen footage of US troops using Sterling sub-machine guns in Iraq so those chaps will use anything! The AA12 is very interesting, its even the right sort of size for a bolter. This is something quite animal in the way robot with corrective balance systems move. Kinda reminds me of a chameleon. Would types of armour also be fitting for this thread? -Adaptive camouflage: The ultimate stealth suit, adaptive camouflage does exactly what its name says it does. It changes colour according to the environment that it's in. I guess the suit would have many small sensors which can detect the light/colours that are surrounding it and simply takes over those colours. This could be in the form of suits, but there are also variants which are used on vehicles such as tanks or aircraft. -Organic battlesuit: Kind of based on those old rumours back on Warseer where the Tau were rumoured to get this suit. The idea is very similar to Eldar Wraithbone which is a living entity. The organic suit could also be seen as that suit Klaatu was wearing in the latest version of The Day The Earth Stood Still. It's basically a giant womb/placenta which protects the wearer from it's potentially risky environment. The material moves very similar to fleshy tissue but is healing at a way faster rate. It can basically take a lot of damage while healing practically instantly. The result of long and expensive genetic research. The suit does need neuro/nerve connections with the user, meaning that the suit in a way becomes part of the body. This also means that the user needs a lot of energy/fuel in the form of food. Higher calorie consumption. Certain types of organic weapons can also be incorporated into the suit, but this is mostly limited to close combat weapons in the form of claws, blades and such made from bone/nail. Weapons with special neuro/nerve connections could also be plugged into the body. Sounds good. I already use the idea of adaptive/ active camo for my version of Space Marines and it will be ported over for AFG and maybe some Legionaries. As for biological armour - it's doable. The machines 'bio-photonic' technology is basically an organic organism building an inorganic machine. The same concept could be used for armour. I've been thinking about pre-Supremacy weapons. I'm sure humans made some pretty sick tech before the machines took over management and started issuing SSG. With the fall many organisations will rearm with lethal weapons, and some of the tech-nightmares of the past may make an appearance. The sniper rifle uses 'Extreme Wavelength' (laser?) technologies. This affects how it is used in the field; as it is not immediately lethal. The beam emitted from the EW-8 has good penetration powers and will pass through most body armours. A person struck by the beam will not be killed immediately. The beam is designed to shred DNA and damage cells on a molecular level. It can take up to an hour for a head shot to kill, with the onset of first symptoms 10-15min after strike. This affects the doctrine of the sniper. The EW-8 is a beam weapon with no kick and pin point accuracy. Targets can be engaged many miles away. Hits are near instantaneous. Shots are invisible and difficult to detect. They can pass through some soft cover and will not break windows. As direct hits are not immediately noticed, with first symptoms developing 10-15min after a hit, this gives a sniper a 'window of opportunity' to hit as many targets as they can in that 10-15mins. These capabilities allow a sniper to set up many miles away from the target and engage in silence. The sniper will try to engage the target when their guard is down, and the EW-8 will not alert them to the attack. After the first hit the clock it ticking. They will take out as many targets as they can see, within the 10-15min window. Each hit is unnoticed. It is only once the first target starts to exhibit symptoms that a savvy person will deduce they are being taken out by an EW-8. If they know about such weapons. EW-8 are classified and most do not know about them pre-Supremacy (due to the case for 'public panic'). They are banned but where available to security contractors, black ops, and assassination teams. I thought this concept had a very dark feel to it. The EW-8 is a terrifying weapon when you think about it and what a lone sniper could do set up on top of a skyscraper. I imagine some kind of force field would be needed to counter it.